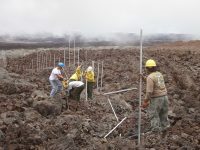 Park staff install the cat-proof fence in rough and rugged high-elevation lava fields on the slopes of Mauna Loa. The five-mile-long fence protects more than 600 acres of Hawaiian petrel habitat, and could be the longest of its kind in the United States. Photo courtesy of National Park Service. Hawaii National Park, Hawai‘i – Work is complete on what could be the largest cat-proof fence in the United States, designed to protect the federally endangered ‘ua‘u, or Hawaiian petrel, from the birds’ primary threat: feral cats. The seafaring ‘ua‘u nests in deep lava rock burrows on the rugged high-altitude slopes of Mauna Loa, and, despite the remote location, are not safe from cats. In order to protect the species, the National Park Service (NPS) teamed up with the National Fish and Wildlife Foundation, U.S. 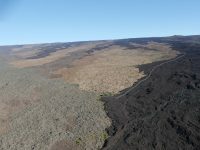 Fish and Wildlife Service, American Bird Conservatory, Hawai‘i Pacific Parks Association, and the Pacific Cooperative Studies Unit at the University of Hawai‘i (PCSU), to build the five-mile long cat barrier fence in Hawai‘i Volcanoes National Park. The specifically designed barrier is more than six feet high, and has a curved top section that prevents cats from climbing over it. Construction began in 2013, and was limited to January through May to avoid disturbing nesting birds. The seabirds spend most of their lives at sea, and come to land only during breeding season. ‘Ua‘u return to Hawai‘i Volcanoes National Park briefly in April to prepare nest sites, and return in early June to lay a single egg. The fluffy chicks hatch in August and remain in their burrows until November when they fledge or take their first flight out to sea. Adults, eggs and chicks are extremely vulnerable to predators throughout the long breeding season as all activity occurs on the ground. The high-altitude project was grueling. NPS and PCSU fence crews worked and camped at elevations between 8,000 and 10,000 feet, in steep and loose lava rock terrain, and in weather that ranged from hail, and high wind, to extreme heat. The site is very remote and all materials, gear and staff had to be flown in and out. But the discomfort paid off: the fence now protects more than 600 acres of ‘ua‘u nesting habitat on Mauna Loa. “To our knowledge, this is the largest fence of its kind in the U.S. To build such a fence is an incredible feat, and an important victory for a native species that is extremely rare on Hawai‘i Island,” said NPS biologist Kathleen Misajon. “Through the partnership of the cooperating organizations, the cat-proof fence will protect these amazing seabirds and support the expansion of this small population,” she said. The endangered Hawaiian petrels are more typically seen on neighbor islands. The species is very rare on Hawai‘i Island, with just 75 nesting pairs in Hawai‘i Volcanoes National Park, and another small population on the slopes of Kohala. The park and cooperating partner agencies have studied this remnant population of ‘ua‘u on Mauna Loa since the early 1990s, both on the ground and more recently, through remote game cameras. The birds only come and go at night, nest in deep cracks and crevices in the lava, and are rarely seen. Both parents take turns incubating a single egg and later, feeding the chick. They fly from high atop Mauna Loa to forage in the Pacific Ocean, ranging as far north as Washington State before returning to the nest to feed their chick.